The idea of syncretism is often derided as some fuzzy New Age concept that blurs the lines between and among authentic religions. Hence those syncretic systems are inauthentic. When I first began my meticulous study of the political theology of the American Founding and there encountered its driving creed ("Christian-Deism," "unitarianism," "theistic rationalism," pick your favorite term) which itself is a hybrid among Protestant Christianity, Deism, and natural religion, one observation coming from the orthodox perspective was that such a creed is too syncretic to be considered authentic Christianity. So, for instance, America's key Founders, following natural religion, held all religious men of all of the worlds' religions worshipped the same God, wherein they argue over the details. Indeed, the knowledge that such a God exists without any external written revelation is available to all men through the use of reason and the senses. As it were, it's not just Jews, Christians and Muslims who worship this same One True God, but so too do unconverted Native Americans (they call Him "The Great Spirit") and Hindus (as the Founders would say "Hindoos"), just about everyone. Over the years, I have presented these findings to folks who read it with a very skeptical eye. They don't like how America's "Christian" and "Judeo-Christian" contributions have been, as they see it, sandblasted from the public square. So they seek to reauthenticate for traditional Christianity what is presented as a novel creation of the Enlightenment period. So I have been told the idea of natural religion, (again, the notion that all men, through the use of reason alone can know God exists and thus worship the same God while differing over the details) has been and is believed in by bona fide historic orthodox Christians. And though they don't all believe it, such is something consistent with the traditional practice of the faith. America's Founders certainly had an ecumenical impulse that the natural law-natural religion satisfied. On the other hand, there is and always has been an anti-ecumenical impulse. The idea that we've got the details all right and you've got it all wrong. Hence your god is/gods are false. America's Founders, for the most part, rejected such. Even for Young Earth Creationist believing fundamentalists, natural religion might provide some kind of rational explanation, given their premises: If God created Adam and Eve and all humanity is so derived, and given most history, especially from very early on, is transmitted orally, it makes sense that those who best kept the faith would have the clearest details of what's true, but that everyone still has some key details right, even if distorted, because we all come from the same place. If all world religions worship the same God, then how do we deal with the issue of polytheism v. monotheism? First, it's not clear that "the monotheistic religions" are as monotheistic as they present themselves. Just as it's not clear that the polytheistic religions are as polytheistic as they have been purported to be. The Bible doesn't simply speak of the One God in the heavenly realm and the many of humanity. Rather, from the beginning it seems there exists a divine heavenly family. Mormons, for instance, have been characterized as polytheistic. To which they accurately reply no, they are henotheistic. Indeed, it's debatable whether the Bible teaches monotheism or henotheism. Small o orthodox Christianity teaches the existence of One God who exists in Three Eternally Distinct Persons. This gets them a charge of polytheism from, among others, Muslims. It's the idea of the More Than One deriving, in some mysterious way, from The One. Again, it's not some fuzzy New Age concept, but an issue that has long perplexed metaphysicians and philosophers. So Hinduism has countless gods (perhaps the most) in its pantheon. But Hinduism can and certain forms do argue the religion is actually monotheistic in that all of the different gods are manifestations of the One True God. Hindus also have a Trinity that parallels the Christian One: It's Brahma, Vishnu, and Shiva. Now, someone committed to an anti-ecumenical understanding of orthodox Christianity, might argue such Trinity has nothing to do with the Christian Trinity. Now, the militant unitarian John Adams devoutly believed in the One True God of the Universe. But he bitterly rejected the orthodox Christian doctrine of the Trinity. The overall context of his letter was to both 1. endorse the natural religion notion that all of the world religions worship the same God, even as they differ over the details, and 2. articulate the genealogy of the Christian Trinity which he rejected as false. Enlightenment rationalists who rejected the Trinity tended to blame Plato for the "fabrication" of the doctrine. But Adams in this letter traces it to Pythagoras. Adams believed both the Hindu and the Christian understandings of the Trinity have the same origin. This too could be understood as a function of natural religion, that all world religions in their essence teach more or less the same thing, ascertainable by reason. But that using their reason, dicker on the exact details. Indeed, the orthodox Christian American Founder Elias Boudinot recognized the similarity between the Christian and Hindu doctrines of the Trinity and likewise attempted to trace the genealogy of the doctrine. But unlike Adams, Boudinot accepted the Trinity as part of Christian doctrine. So, as it were, the Hindus must have got it from the Hebrews. As per the natural religion explanation, all world religions believe in the same essential truth, discernible from reason and the senses, even if the different groups distort details. But still, what J. Adams and E. Boudinot would both agree with is that orthodox Christianity and Hinduism share the notion that from the One True God manifests Three. The Hindu notion is that there is One that splits into Three (and then perhaps more). The orthodox Christian notion is that from One, in some mysterious way, Three Exist. Throckmorton: "No, David Barton, I Did Not Recruit Jay Richards"
Fea: "To Be Faithful to Jesus or Secular Paganism?" In case you have not heard, "secular pagans" are rewriting American history and having "difficulty embracing the facts of history." I am apparently one of these secular pagans. In the latest example of the Christian Right's failure to fully grasp the complexity of the American founding, David Lane of the American Renewal Project has chosen to criticize me at the website of the Christian magazine Charisma. I have written about Lane before. I am quoted in a recent Reuters piece about Lane and his attempt to get evangelical ministers to run for political office. I also wrote a blog post in the wake of that article. Yet Lane does not want to address those articles. Instead, he has chosen to focus on a recent interview I did with National Public Radio that appeared over Thanksgiving weekend. Tillman: "Miscellaneous Americana for the New Year"
It is all too easy to speak of the American colonies as settled by Englishmen. But not all who came to the New World, of those who owed allegiance to the Crown, came from England. Some were Manx. A few came from the Channel Islands, where the Queen is still styled Duke (not Duchess) of Normandy! A good many were Welsh, Scottish, and Irish, particularly from Ulster. It is even more difficult to remember that settlers from these different places brought with them different parliamentary and legal traditions, and also different usage in regard to spoken and written English. See, e.g., Nora Rotter Tillman; Seth Barrett Tillman, A Fragment on Shall and May, 50 American Journal of Legal History 453 (2010); see also, e.g., James E. Pfander & Daniel D. Birk, Article III and the Scottish Enlightenment, 124 Harvard Law Review 1613 (2011) [http://ssrn.com/abstract=1706368]. M. Andrew Holowchak, Ph.D.: "Did Jefferson Believe in the Afterlife?" At day’s end, it is likely that Jefferson, given his purchase of materialism, never really took seriously belief in an afterlife—at least, not late in life. In short all good people, even if they aren't Christians like Aristides and Cato get into Heaven. And orthodoxy doesn't matter. 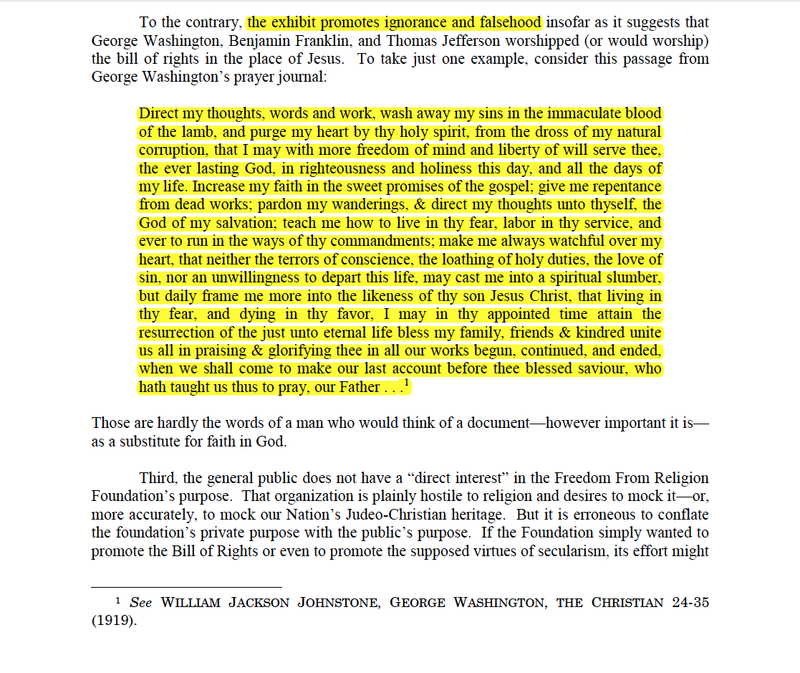 Even if you are orthodox (Presbyterians and Baptists) you can get into Heaven in spite of your orthodoxy, which Jefferson rails against later on in this letter. But I'm sure Dr. Holowchak would write this off as persiflage. You can check out the display in the Patheos article. I don't find it offensive at all. But then again, I like satire, parody, iconoclasm, South Park among other things. But the Governor claims "it promotes ignorance and falsehood" to suggest G. Washington, B. Franklin, and T. Jefferson "would worship" the Bill of Rights over "Jesus." I don't suggest that these men worshipped the Bill of the Rights. But they worshipped God, not Jesus. Jefferson was a militant unitarian in his rejection of Jesus' divinity. Franklin was gentler in the way he dealt with the Trinity. But he is on record supporting the unitarian project and claiming to "have doubts" as to Jesus' divinity (though Franklin never doubted Providence). And George Washington also gives no evidence of being a Jesus worshipper as opposed to a Providence worshipper. We could say, well the Governor goofed with one word. He should have just said "God" and not "Jesus." But because of the lack of real evidence for George Washington being a Jesus worshipper, the Governor cited a long passage from the Daily Sacrifice (which uses orthodox Trinitarian language), a spurious document. This is a real example on how Christian Nationalist revisionist history harms. Do they worship the same God with an as it pertains to America's Founding Political Theology? -- John Adams to M.M. Noah, July 31, 1818. Check out John Fea's post on the controversy. Bottom line, Wheaton, an evangelical Christian college, is formally disciplining a professor for suggesting they do. Check out Francis Beckwith's outstanding post which Fea links to. And also the Washington Post article by Miroslav Volf. My beef with Wheaton isn't the notion that Christians and Muslims worship different gods; I think evangelicals or other kinds of Christians are entitled in good faith to hold that position. But as Volf, Beckwith and others demonstrate, one could also be a devout orthodox Christian and believe they do worship the same God, the God of Abraham. Wheaton should respect that intellectual diversity. That's my issue with them. The "key Founders" like John Adams were on the side of believing Jews, Christians and Muslims worshipped the same God. Hence the above quotation by John Adams. There is one issue I have with some of the orthodox Christians who believe Christians and Muslims worship different gods that gets discussed in the linked articles. I don't like specially plead hypocritical arguments and assertions and this is one of them: That Jews and Christians worship the same God, Muslims a different one. Almost all of the arguments that can be made on behalf of the case that Christians and Muslims worship different gods can also be used to prove Christians and Jews worship different gods. For instance, orthodox Christians worship a Triune God, Muslims a unitary One. Jews worship a unitary God as well. The Muslim's God doesn't have an only begotten Son (Jesus). Well Jews reject Jesus as God's only begotten Son and that He is Messiah. They either all worship the same God or different gods. You can't have it both ways. Dr. Gregg Frazer, by the way, is consistent here. He not only believes they all worship different gods, but that "Christians" who reject the Trinity worship a different God as well. Likewise one of the articles intimates, wrongly in my opinion, that orthodox Christians don't dare suggest that Jews and Christians worship different gods. I think plenty still do. And in the past, when Antisemitism was more acceptable, I'm sure many notable theologians endorsed the notion that since rejecting Jesus as Messiah, Jews no longer worship the same God Christians do. In the comments section Tom Van Dyke points to Martin Luther's position on the Book of Revelation. At least it was a position he held at one point in his life while he was pondering which books of the canon were inspired by the Holy Spirit. First and foremost, the apostles do not deal with visions, but prophesy in clear and plain words, as do Peter and Paul, and Christ in the gospel. For it befits the apostolic office to speak clearly of Christ and his deeds, without images and visions. Moreover there is no prophet in the Old Testament, to say nothing of the New, who deals so exclusively with visions and images. For myself, I think it approximates the Fourth Book of Esdras; 8 I can in no way detect that the Holy Spirit produced it. Moreover he seems to me to be going much too far when he commends his own book so highly — indeed, more than any of the other sacred books do, though they are much more important — and threatens that if anyone takes away anything from it, God will take away from him, etc. Again, they are supposed to be blessed who keep what is written in this book; and yet no one knows what that is, to say nothing of keeping it. This is just the same as if we did not have the book at all. And there are many far better books available for us to keep. Many of the fathers also rejected this book a long time ago; 9 although St. Jerome, to be sure, refers to it in exalted terms and says that it is above all praise and that there are as many mysteries in it as words. Still, Jerome cannot prove this at all, and his praise at numerous places is too generous. Finally, let everyone think of it as his own spirit leads him. My spirit cannot accommodate itself to this book. For me this is reason enough not to think highly of it: Christ is neither taught nor known in it. But to teach Christ, this is the thing which an apostle is bound above all else to do; as Christ says in Acts 1, “You shall be my witnesses.” Therefore I stick to the books which present Christ to me clearly and purely. The bold face is mine. A few thoughts. First, this sounds Quakerish to me. Luther is the founder of Protestantism and Quakerism is a form of Protestantism. Quakerism is I would describe Spirit trumps Letter (and there's textual support in the canon for that). You could say Spirit trumps written Revelation. But that would be not precise enough. Perhaps Spirit trumps the written word. Or rather the Spirit speaking to the individual, Priest that she is, in good conscience determines which books are inspired and how to understand them. As opposed to some external collective authority determining the matter. In common discourse we hear the term "the Bible" bandied about. And that's fine. I don't mean to deconstruct the notion of a canon of books that contains, for those who so believe, revelation in a God speaking to man sense. Reformed Protestants, Roman Catholics and Eastern Orthodox all have different exact books. And there are two incompatible quick narratives I have heard from the Protestants v. Roman Catholics. On the one hand Position 1 of evangelical or fundamentalist oriented Protestants seems to argue that the Bible is 66 books and only 66 books, and always has been. Roman Catholics added additional books to the canon in Trent. Then we got the King James Bible, with its bowdlerized 66. And Trent was needed to formalize the Roman Catholic position against Luther's/the Protestants' novel act. The truth is probably somewhere in between the positions, but I have concluded closer to position 2. In fact, from the very start when the early Church began to compile a "canon" of books, the exact contents -- which books belonged -- were disputed and different regions had different exact books. Belief in the divine inspiration of the deuterocanonicals was hardly novel to Trent. Early Church Fathers (who among themselves differed on which exact books they believed were inspired) believed in them. And the Eastern Orthodox believe in those books and add a few others that Roman Catholics don't consider part of their canon. And the different capital O Orthodox Churches themselves differ on the exact books depending on region. The Eastern Orthodox split with Rome in 1054 way before Trent. I'm not interested in the various reasons Protestants have for the King James Bibles that the canon is these 66 and no others. Rather I'm looking for evidence that their position is not novel to the reformation. Some evangelical-fundamentalist types take it as a matter of faith that once the last book of the 66 was written, "true Christians" always just knew it was these 66 and no more, no less. I haven't been able to find any historical evidence to support such position. On a personal note, I don't deride the Book of Revelation like Jefferson does; my position is probably closer to Luther's. I see the book as interesting poetry; but if someone tries to proof text it at me as containing divinely inspired doctrine, I would simply write it off. Clearly I'm no fundie. But then again, neither was Luther. 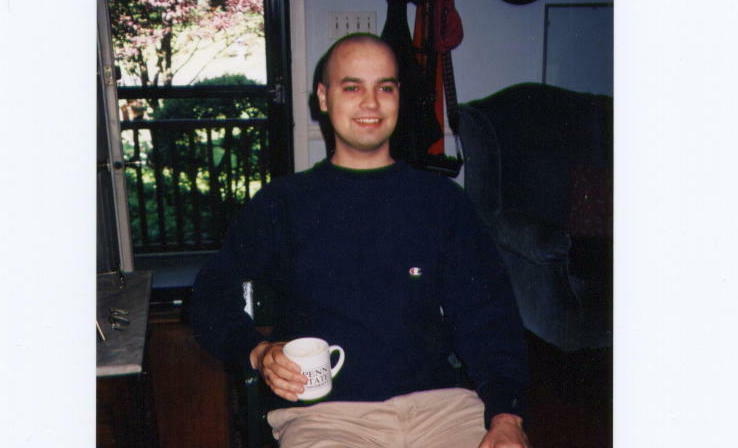 Over a decade ago, I became involved as one of the more minor players in the blogsphere in a debate over unenumerated rights. The biggest player was of course Randy Barnett. And my blogfather Timothy Sandefur was involved in the debate then. Over the course of the decade, Sandefur has become more of a heavy hitter in the discourse. A timely similar debate has arisen over the the doctrine of "substantive due process," something part of the unenumerated rights discourse. Constitutional issues that deal with the "rights of man" are like a game of whack a mole. If you don't find them under the privileges or immunities clause, they will pop up out of the due process clause and elsewhere. Arguably, they spring out of the Declaration of Independence. When I noted above that Sandefur is more of a "heavy hitter" it's because of things like the (to my mind) pleasantly surprising drift of the venerable George Will towards libertarianism and Sandefur's influence on Will in this regard. Check out Will's column here. So here is Timothy Sandefur v. Matthew Franck. Here is a piece by Evan Bernick attacking Franck's position. Below I excerpt from Franck's piece because, discussing Will's article, it contains links to a debate he had with Hadley Arkes on the Declaration of Independence and its justiciability under America's system of constitutional law. This effort to obscure the response of historians, Christian and otherwise, to Barton’s work is a farce. The Jefferson Lies was voted “least credible history book in print’ by readers of the History News Network. Dozens of Christian historians wrote both Family Research Council and Focus on the Family in 2013 urging them to remove Barton’s work from their web pages. If WND editors cared about accuracy, they could just read their own website. In the article WND published yesterday, there is a reference by Barton to his Christian historian critics. My own personal observation is the biggest bone of contention in Barton's book is that Jefferson was some kind of traditional or orthodox Christian before 1813. There is no evidence for this. There is evidence that Jefferson was much chattier about his heterodoxy from 1813 onwards. Jefferson after 1800 was influenced by Joseph Priestley's Socinian Unitarian Christianity. But there's not a shred of evidence that Priestley took Jefferson away from orthodox or traditional Christianity. Rather, it's just as likely Priestley took Jefferson away from a less traditional Deism and made him feel more comfortable with a Christian identity. I'll offer a bit in support of the speculation. Jefferson was influenced by Bolingbroke before Priestley. Even Bolingbroke might not have been quite as "strictly deistic" as one might think. But he was arguably more heterodox than Priestley. [I]t is between 50. and 60. years since I read it, & I then considered it as merely the ravings of a Maniac, no more worthy, nor capable of explanation than the incoherences of our own nightly dreams. Bolingbroke had very similar views on the Book of Revelation. Plus 50 years before 1825 is 1775. He's admitting in this letter he was heterodox enough to consider one of the books of the canon the ravings of a maniac. Juan Cole: "Trump vs. the Founding Fathers on Muslims Coming to US"
George H. Smith: "John Locke: In Search of the Radical Locke"
[B]ut for now I wish to discuss the theory, accepted by virtually every modern Lockean scholar, that most of the Second Treatise was written years before the Glorious Revolution. Fea: "Have You Heard About the American Renewal Project?" I recently talked to Reuters journalist Michelle Conlin about David Lane and the American Renewal Project. You can read her finished piece here. The American Renewal Project is a network of 100,000 ministers and pastors (as far as I can tell they are mostly white, conservative evangelical, middle-aged men) who are trying to get 1000 pastors to run for office in 2016. One look at the American Renewal Project website reveals that this is yet another wing of the Christian nationalist movement. There are stories about revolutionary-era clergy who supported the American Revolution, defenses of the idea that the United States was founded as a Christian nation, and discussions of pastors running for political office to "save the soul" of America. Lane is a Christian Right activist who believes that we need to "wage war to restore a Christian America." His use of history comes straight out of the David Barton playbook. In fact, Barton is a supporter of this movement. Washington Post: "The fascinating history of how Jefferson and other Founding Fathers defended Muslim rights"
Indeed, it wasn't just Jefferson and Madison who were discussing the bounds of religious freedom in the crucial Virginia debate, said historian John Ragosta, author of numerous books on Jefferson and religious freedom. "Baptists and Presbyterians were really demanding religious freedom in the 18th century because they were dissenters from the established church," Ragosta said. "And they were talking about Muslims and ‘infidels’ and Jews." Evangelicals had been subjected to religious persecution not long before. Prior to the American Revolution, more than half of Virginia's Baptist ministers were jailed for preaching, Ragosta said. "These people knew what they were talking about." Opponents of Jefferson's proposal wrote letters to the Virginia Gazette, arguing that it would allow atheists, Muslims and Jews to hold office — to which evangelicals responded, “that’s right,” Ragosta said. As I was jotting down possible sessions I might want to attend I came across AHA Session 3 on Thursday afternoon: "Are the Culture Wars History? New Comments on an Old Concept." I was attracted by the high-powered panel of historians--Andrew Hartman, Adam Laats, Natalia Petrzeal, Stephen Prothero, and Leo Ribuffo. I marked it down as a must-attend panel. In 2012, Messiah College history professor John Fea set Glenn Beck and his followers ablaze when he claimed that Barack Obama might be “the most explicitly Christian President in America.” Responding to the hundreds of angry comments he received, Fea wrote a follow-up post on the need for civility entitled “The Culture Wars Are Real.” The title of Fea’s essay was old news, as Americans had been talking about the “culture wars” ever since the publication of James Davison Hunter’s 1991 book on the subject. Yet Fea’s title also betrayed a tone of defensiveness—that maybe, for some, the culture wars weren’t and aren’t real. To top yesterday's post, below is Philip Hamburger, Douglas Laycock, Marci Hamilton and Michael McConnell speaking at the Constitution Center on religious liberty issues. They are arguably the four leading scholars of religion and the US Constitution. Check out Philip Hamburger and Douglas Laycock -- two of the foremost authorities on the matter -- discussing the current state of religious liberty in the United States. Ed Feser often has interesting and thoughtful things to say. In this post he criticizes the concept of Sola Scriptura from the perspective of traditional Roman Catholicism but with a corresponding analysis of empiricism. But what does this have to do with sola scriptura? The idea is this. Summarizing an early Jesuit critique of the Protestant doctrine, Feyerabend notes that (a) scripture alone can never tell you what counts as scripture, (b) scripture alone cannot tell you how to interpret scripture, and (c) scripture alone cannot give us a procedure for deriving consequences from scripture, applying it to new circumstances, and the like. Let’s elaborate on each and note the parallels with modern empiricism. First, there is no passage in any book regarded as scriptural that tells you: “Here is a list of the books which constitute scripture.” And even if there were, how would we know that that passage is really part of scripture? For the Catholic, the problem doesn’t arise, because scripture is not the only authoritative source of revealed theological knowledge in the first place. It is rather part of a larger body of authoritative doctrine, which includes tradition and, ultimately, the decrees of an institutional, magisterial Church. I agree the idea that you simply look something up in the Bible to find answers doesn't work. Protestants I've heard say "Bible interprets Bible." Well Bible interprets Bible to produce all sorts of contradictory understandings. I sometimes have a hard time distinguishing between Sola Scriptura and fideism. I'm something of an expert on the political theology of the American Founding. While there were orthodox Trinitarians, deists, unitarians and folks all over the spectrum among them, the prevailing political theology rejected fideism and incorporated "essences" in nature as a necessary component for proper theological understanding (and it tended to be in nature, not in special revelation where they parked the public issues). But whoever expects to find, in [Scripture], particular directions for every moral doubt which arises, expects more than he will find. They generally presuppose a knowledge of the principles of morality; and are employed not so much in teaching new rules on this subject, as in enforcing the practice of those already known, by a greater certainty, and by new sanctions. They present the warmest recommendations and the strongest inducements in favour of virtue: they exhibit the most powerful dissuasives from vice. But the origin, the nature, and the extent of the several rights and duties they do not explain; nor do they specify in what instances one right or duty is entitled to preference over another. They are addressed to rational and moral agents, capable of previously knowing the rights of men, and the tendencies of actions; of approving what is good, and of disapproving what is evil. Wilson ends the discussion by asserting "that the scriptures support, confirm, and corroborate, but do not supercede the operations of reason and the moral sense." The "operations of reason and the moral sense" were to Wilson among other things the teachings of the Scottish Common Sense Enlightenment in which he was imbibed. He could incorporate those truths into his theology just as Aquinas incorporated Aristotle. This is a rejection of fideism. Is it a rejection of Sola Scriptura? Perhaps. Though I have learned that there is a much neglected tradition of the natural law in orthodox Protestantism (it goes without saying that such tradition exists in unorthodox, freethinking Protestantism too). So if "the Bible alone" is insufficient, there is always the natural law as an added component to achieve a holistic understanding. But this still does not solve the dilemma posed by Feser. On a personal note -- the approach that I am sympathetic to -- is the most radical Protestant one: The Quakerish approach. And that is to concede everything Feser and critics of Sola Scriptura note and conclude there is no problem. That's because it's up to the individual -- radical priest that she is -- to determine for herself how to understand, including which books are inspired, what they mean, and whether there are errors in them. Now, it should be done "in good faith" according to the dictates of conscience. And truth is what it is. You don't just get to make stuff up. There are a lot of learned folks out there who will call you out if you do. [A]nd to have made the 'law of the eternal God, as contained in the sacred Scriptures, of the Old and New Testament, the supreme law of the United States,' would, I conceive, have laid the foundation of endless altercation and dispute, as the very first question that would have arisen upon that article would be, whether we were bound by the ceremonial as well as the moral law, delivered by Moses to the people of Israel. Should we confine ourselves to the law of God, as contained in the Scriptures of the New Testament (which is undoubtedly obligatory upon all Christians), there would still have been endless disputes about the construction of the of these laws. Shall the meaning be ascertained by every individual for himself, or by public authority? If the first, all human laws respecting the subject are merely nugatory; if the latter, government must assume the detestable power of Henry the Eighth, and enforce their own interpretations with pains and penalties. For your second article, I think there could be no occasion in the confederacy, provision having been made to prevent all such claim by the particular constitution of each State, and the Congress, as such, having no right to interfere with the internal police of any branch of the league, farther than is stipulated by the confederation. To the effect of part of your third article, that of promoting purity of manners, all legislators and magistrates are bound by a superior obligation to that of any vote or compact of their own; and the inseparable connexion between the morals of the people and the good of society will compel them to pay due attention to external regularity and decorum; but true piety again has never been agreed upon by mankind, and I should not be willing that any human tribunal should settle its definition for me. Livingston is sympathetic to the notion that each individual decides for himself how to understand the Christian religion. Therefore any and all human laws that try to properly understand, define or Livingston's actual word "respect" Christianity are nugatory. It's a good argument as to why America was not founded to be a "Christian nation." Freemasonry was a surrogate religion for enlightened men suspicious of traditional Christianity. It offered ritual, mystery, and communality without the enthusiasm and sectarian bigotry of organized religion. But Masonry was not only an enlightened institution; with the Revolution, it became a republican one as well. As George Washington said, it was "a lodge for the virtues." As Masonic lodges had always been places where men who differed in everyday affairs -- politically, socially, even religiously -- could "all meet amicably, and converse sociably together." There in the lodges, the Masons told themselves, "we discover no estrangement of behavior, nor alienation of affection." Masonry had always sought unity and harmony in a society increasingly diverse and fragmented. It traditionally had prided itself on being, as one Mason put it, "the Center of Union and the means of conciliating friendship among men that might otherwise have remained at perpetual distance." Gary Scott Smith: "A nation on a hill?" When the colonies came together as the United States, the new nation broke with this 1,450-year practice of religious establishment. Not having a king was radical enough, but even more radical was the new nation’s decision not to establish a national church. The First Amendment to the Constitution, adopted in 1789 and ratified in 1791, prohibited Congress from establishing a church and from preventing citizens from worshiping as they pleased. The founding fathers adopted this arrangement for several reasons. For one thing, they knew that the experiment had already been tried for over a century, and it had not led to the moral collapse many feared. The exiled Roger Williams had permitted freedom of worship in the colony of Rhode Island, which he founded in 1636. So did Quaker William Penn in Pennsylvania, which he established in 1681. And these colonies were thriving. Fea: "John Oliver Tackles Fake Founders' Quotes"
Watch Oliver do so at John Fea's blog here. New Responses to Eric Nelson's "Royalist Revolution"
Here is Eric Nelson's book. Here is a piece by Yoni Appelbaum at The Atlantic. And here is something from The Originalism Blog which links to Tara Helfman's Harvard Law Review article and Dr. Nelson's response on the matter. The conversation makes one reflect on the transformation of "monarchy" to "democratic-republic" or "liberal democracy" or whatever we term not just America but Great Britain and the rest of the "democratic" world. Great Britain and other Western European nations presently still have monarchies (and state established churches). We understand their power now is "titular." Marginal Revolution: "Thomas Merrill on David Hume’s coalition"
Q. You are a Southern Baptist min­ister who now calls himself a “post-denominational Christian.” What specifically about your faith led you to take this case on? Prescott: I call myself a “post-denominational Christian” because today differences between denominations are insignificant in comparison to the divisions between conservative and progressive Christians within each denomination. In Baptist life only a remnant remain advocates for separation of religion and government. On this issue, I find that I have more in common with progressive-minded people of other denominations, other faiths and people of no faith than I do with most contemporary Baptists. Few people today know that the earliest Baptists were some of the foremost champions of separation of church and state. Those Baptists championed liberty of conscience, and by that they meant the universal right to self-determination in matters of religious belief and worship. They held that decisions regarding religious life and eternal destiny are intensely personal and require a conscientious commitment by a mature individual. Convictions so central to the integrity of personality and character could not be delegated to others — least of all to the government. In their eyes, genuine faith could not be coerced or handed down like an heirloom. That led them to become advocates for religious liberty for everyone — including pagans, atheists, Jews, Muslims and people of other faiths. I share these convictions of the early Baptists. That is why I opposed placing the Ten Commandments mon­ument at the state capitol in Oklahoma. In that location, the monument symbolizes a union of church and state that is detrimental to both. In effect, it serves notice that the government endorses a certain stream of religion and treats its adherents preferentially. It gives the appearance that persons of no faith and people of other faiths are second-class citizens. True, but two points. One is the understanding of "Deism" being offered here is that of the impersonal God of "strict Deism." Arguably there are other viable definitions of the term. However to many very learned folks in today's scholarly discourse (such as Nussbaum and Forte) that's what the term has come to mean. Second, if you look at the utterances from the Founding era that Forte offers to support the claim, they are all, we could say, generically monotheistic: James Madison's "Governor of the Universe"; Thomas Jefferson's liberty securing, gifting "God" of justice; the "Creator" of the Declaration of Independence who endowed men with "unalienable rights"; and George Washington's "Almighty Being who rules over the Universe." None of these is necessarily the Triune God of orthodox Christianity. If you read Forte's article in detail, you see he attempts to answer a question posed by Justice Kagan that basically asked (my words, not hers) "what if this Court endorsed Christianity?" It doesn't but it does endorse generic God belief. "Ceremonial Deism" is a word off putting to many of those who like terms like "so help me God" and "God save ... this Honorable Court." I mentioned this topic in my last post where I discussed Alexander Hamilton's death. As most readers know, I endorse the scholarly consensus holding that though Hamilton always seemed to have believed in God, he wasn't an orthodox Christian (what some folks define as a "real Christian") until the end of his life, after his son died in a duel. Before that he was, pick your term: 1. a nominal Christian; 2. a "Christian-Deist"; 3. a "theistic rationalist." Some challenge this scholarly consensus. I remember one fairly articulate, learned blogger who did, criticizing me in particular; but he seems to have exited the blogsphere years ago. When so challenged, of course, we must return to the primary sources and carefully read them. Indeed, perhaps so closely that we memorize them. When looking for "details" we may sometimes focus on one or more (often what we are looking for) and ignore others. We should not ignore the points the other side makes, but do our best to answer them. However, interestingly, sometimes relevant points exist right there on the page that neither side addresses and thus get lost. In 2010, at First Things Joe Carter linked to a post of mine on Hamilton's death, where that above mentioned blogger critical of me showed up in the comments section and challenged my (after more reputable scholars') analysis. That means we must read the original writings of Bishop Benjamin Moore [Episcopalian] and Pastor J.M. Mason [Presbyterian], the two ministers from whom Hamilton sought communion when near death after being shot. Rev. Moore hesitated to give Hamilton the communion. He did not deny it, he hesitated; according to his own letter, he wanted to give the dying man time to reflect, so that he did not take the Lord's Supper in haste. Okay. Hamilton was dying, immediately within if not days, hours (for all they knew). And Bishop Moore did indeed say he wanted "to avoid every appearance of precipitancy in performing one of the most solemn offices of our religion...." I had to look precipitancy up in the dictionary. It means "undue hastiness or suddenness." Moore then said "I did not then comply with his desire." So yes, this was an initial denial. The blogger could term it a "hesitation" only because Moore ended up relenting and giving Hamilton communion. I [Moore] observed to him [Hamilton], that he must be very sensible of the delicate and trying situation in which I was then placed: that however desirous I might be to afford consolation to a fellow mortal in distress; still, it was my duty, as a minister of the Gospel, to hold up the law of God as paramount to all other law: and that, therefore, under the influence of such sentiments, I must unequivocally condemn which had brought him to his present unhappy condition. He acknowledged the propriety of these sentiments, and declared that he viewed the late transaction with sorrow and contrition. I then asked him, "Should it please God to restore you to health, sir, will you never be again engaged in a similar transaction? And will you employ all your influence in society to discountenance this barbarous custom?" His answer was "That, sir, is my deliberate intention." Let those who are disposed to justify the practice of dueling, be induced, by this simple narrative, to view with abhorrence that custom which has occasioned an irreparable loss to a worthy and most afflicted family; which has deprived his friends of a beloved companion, his profession of one of its brightest ornaments, and his country of a great statesmen an a real patriot. Rev. Mason (who, with his father, had been close friends with Hamilton since Hamilton's youth) was not allowed to administer the communion to his friend because the church forbid him, under any circumstances, to administer it privately. Yes it's true that the Presbyterians like the Episcopalians had strict rules relating to the administering of communion with which Hamilton apparently was unaware and that lead to Hamilton's clumsy Christian death. But there's more to the story. This last passage introduced the affair of the duel, on which I reminded the General, that he was not to be instructed as to its moral aspect, that the precious blood of Christ was as effectual and as necessary to wash away the transgression which had involved him in suffering, as any other transgression; and that he must there, and there alone, seek peace for his conscience, and a hope that should “not make him ashamed.” He assented, with strong emotions, to these representations, and declared his abhorrence of the whole transaction. “It was always,” added he, “against my principles. I used every expedient to avoid the interview; but I have found, for some time past, that my life must be exposed to that man. I went to the field determined not to take his life.” He repeated his disavowal of all intention to hurt Mr. Burr; the anguish of his mind in recollecting what had passed; and his humble hope of forgiveness from his God. The Christian Observer in 1805 gave a review of Mason's Oration on the Death of Hamilton. The review not only slams Hamilton's UNCHRISTIAN conduct of dueling, but also slams Moore for not being critical enough of Hamilton's unChristian conduct that led to his death. The C.O. piece also examines Hamilton's Statement on Impending Duel with Aaron Burr and from their perspective demolished it. Hamilton's account was (my words, paraphrasing) I went to the duel to protect my honor, but would not shoot at Burr. So Burr took advantage of the situation and killed him. But the Christian Observer didn't buy Hamilton's self serving explanation. It is regard to reputation then which induces him to violate the strongest obligations of religion and morality. It is true that this regard to reputation is clothed in the honourable guise of an ability to be in future useful. But are we to do evil, or to yield to a prejudice which we know to be both absurd and sinful, that we may have the power of doing good afterwards! Very interesting. Obey God not man. Acts 5:29. I'm used to dealing with that chapter and verse when "man" is earthy government that a believer ought disobey. Here "man" is simply popular opinion represented in notions of "earthly honor." And the "consequences" the believer is to deal "with the fortitude of a martyr" is not a governmental punishment which for the martyr was often death, but rather an injury to "honor." But to tie this back to the context of Hamilton's twice being denied communion only to have one of the ministers (the Episcopalian Bishop Moore) relent and serve Hamilton communion, the elephant in the room was the inconsistency between the practice of Hamilton's dueling and the practice of Christianity. I stand by my assertion that Hamilton was a newbie orthodox Christian at death. However, the issue for the ministers was that given he engaged in this unChristian practice of dueling, they doubted he was a "real Christian" deserving of communion. AFA's Rusty Benson on "What Is a Christian?" A Christian is one who is so gripped by Christ’s love that he dies more and more to any other person, thing, or idea that would compete for his allegiance. When he first repents, a Christian sees himself in the words of the prodigal son. Though he progresses in the Christian life, he never outgrows his need for Christ and the gospel. In fact, a Christian’s sense of his unworthiness grows as Christ becomes greater in his eyes. 2 Corinthians 5:21 – “For He made Him who knew no sin to be sin for us, that we might become the righteousness of God in Him. By faith, a Christian trusts that Jesus fully paid the penalty of sin due each of us and perfectly satisfied God’s justice. It’s a transaction in which Jesus willingly takes the punishment for a Christian’s sin; the Christian gets Jesus’ perfection. 1 John 3:1a – “Behold what manner of love the Father has bestowed on us, that we should be called children of God! A Christian never gets over the wonder of God’s love for him and mercy given to him through Christ. He is forever overwhelmed at the miracle of his own salvation. This is an interesting standard that the author notes is influenced by some notable orthodox Protestant theologians. As it relates to the American Founding, the problem for the AFA (who seem very sympathetic to a "Christian America" view of the Founding) is that none of the key Founders (the first four Presidents and Ben Franklin) was, according to this standard, a "Christian." And Alexander Hamilton (arguably a key Founder) wasn't a Christian until the end of his life, after his son died in a duel (and after Hamilton did his "work" as a Founder). According to the above test, only "born again" Christians who believe in the "Incarnation" are "true Christians." Likewise the list intimates other doctrines like Sola Fide and the Satisfaction Theory of the Atonement as part of the definitional mix. Unitarians, by their nature deny the Incarnation, and by necessity the "satisfaction theory of the atonement." (This is why we can say some unitarians have an "unorthodox" understanding of the "atonement," while others just reject the atonement). Militant unitarians J. Adams and Jefferson, for instance, rejected both the Incarnation and the Satisfaction Theory of the Atonement (Jefferson rejected the atonement and Adams may have held to an unorthodox understanding of the doctrine). Franklin didn't seem to accept the Incarnation when, at the very end of his life answering Ezra Stiles' question on who Franklin thought Jesus was. Tellingly, after informing Stiles he had "Doubts as to [Jesus'] Divinity," Franklin doesn't identify Jesus as Savior/Messiah/or Son of God (all things compatible with and believed by various forms of then existing unitarian Christianity), but rather as someone whose "System of Morals and his Religion as he left them to us, the best the World ever saw, or is likely to see;..."
Likewise, George Washington and James Madison were no evangelical, "born again" Christians. Both, though they often expressed their devout belief in Providence, did not talk about Jesus or evince belief necessary to pass Rusty Benson's biblical standards. Both may have been like Jefferson and J. Adams, unitarians. But they left little on the public record relating to belief in doctrine beyond endorsement of more general concepts like warm Providentialism. If George Washington was orthodox (I don't think he was, but don't necessarily rule it out), it was in the Anglican tradition, which does not teach the necessity of being "born again." Indeed, the latitudinarian tradition of the Anglican Church offered much latitude on matters of "doctrine," even transcending orthodox Trinitarian belief. This is a point Dr. Joseph Waligore makes on "Christian-Deism." Waligore's "Christian-Deists" like Dr. Gregg Frazer's "theistic rationalists" (and those terms are arguably six and one half dozen of the other) seemed quite comfortable in the latitudinarian wing of the Anglican (and then Episcopalian) Church. Attempts to make James Madison into an orthodox or evangelical Christian invariably relate to out of context statements made while very young to William Bradford. For more on the context, see this classic article by James H. Hutson. As noted, Madison, like Washington, could be sphinx like in refusal to put his specific doctrinal beliefs (as opposed to endorsement of generic warm Providence) on the table. But attempting to latch onto the young Madison's letters to William Bradford as smoking gun proof is thin gruel. And there is much in Dr. Hutson's article that provides helpful understanding of context (testimony by, among others, Bishop William Meade, James Ticknor, and Rev. Alexander Balmaine who said Madison's political association with those of "infidel principles" either changed or made him suspicious of the "creed" of orthodox Christianity which Madison was coming out of). 2. his un-Christian like conduct engaging in a duel which was condemned by the faith. By the way, I have never given serious thought on the relation of the practice of "dueling" (which seems to exist in a much less civilized way today with things like gang shootouts and even fist fights) to "Christianity," but note BOTH of the orthodox ministers in the churches with whom Hamilton sought communion (again, the 1. Episcopalian and 2. Presbyterian) condemned the action as sinful, made a personal issue out of it, and thus knowing Hamilton would soon meet his maker and concerned with his soul demanded he repent of this conduct which led to his death. But to tie Hamilton's faith to the original article, Rusty Benson intimates that Donald Trump isn't a "real Christian," but Trump attempts to give a fig leaf of cover to being one. Hamilton's "Christianity," before his son died, likewise appears such. Hamilton, very talented statesman he, had all of the prideful, arrogant, obnoxious, egotistical, narcissistic bluster, and sexual improprieties associated with Trump.